Wish I had more time to read NRx & HBD blogs and related commentary, but I’ve been glued to the stock market in anticipation of the market breaking higher, in which case I am prepared. The Grey Enlightenment is a midpoint between the ‘Dark Enlightenment’ and ‘The Enlightenment’, in rejecting egalitarianism and liberalism but supporting capitalism, technology, and the study of human biodiversity (HBD). Anther theme of the blog is debunking sensationalism, whether it’s doom and gloom, economics nonsense, liberalism in the news, or get-rich-quick schemes. Based on my economic analysis, there is no compelling reason for much further downside in the market. Today Nike had huge earnings in agreement with my thesis that the economy fundamentally sound thanks to consumer spending, especially consumer spending from the wealthy and foreign consumer. The left insists that QE is driving the market higher, ignoring the role of blowout earnings from companies such as Nike, Disney, Google, and Apple…ignoring the role of the consumer, technology, and globalization. 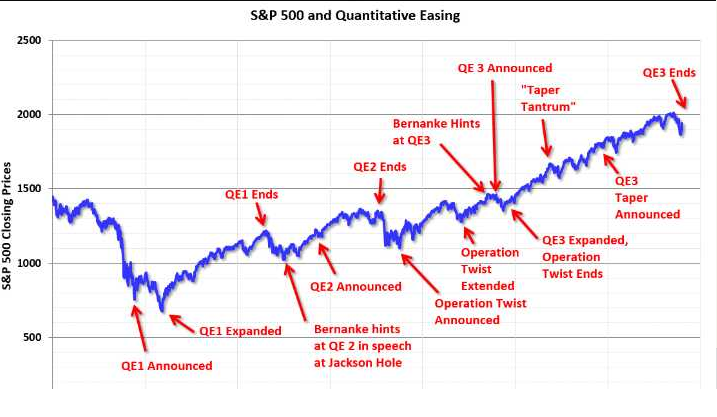 The correlation between QE and rising stock prices may merely be coincidental. For example, the fed began to taper way back in Spring 2013, but the market rallied another 20% in the two years that followed. The market continued to rise after the fed officially ended QE in October 2014. But if the market and economy were entirely dependent on QE, there would have been a bear market and recession in 2013, which obviously there wasn’t. As you can see, there is huge growth of Nike sales in in China. So much for that China crisis, libs. Another doom and gloom prediction debunked by empirical evidence and data. Nike apparel is not cheap, as everyone knows. So when the left says the consumer is dead, capitalism is dead, or the economy is weak, the left is projecting their own personal anti-capitalism biases instead of being impartial to the data. There is weakness in some areas such as wage growth, but strength in many others like consumer spending. Does Tesla Really Lose $4,000 Per Car?